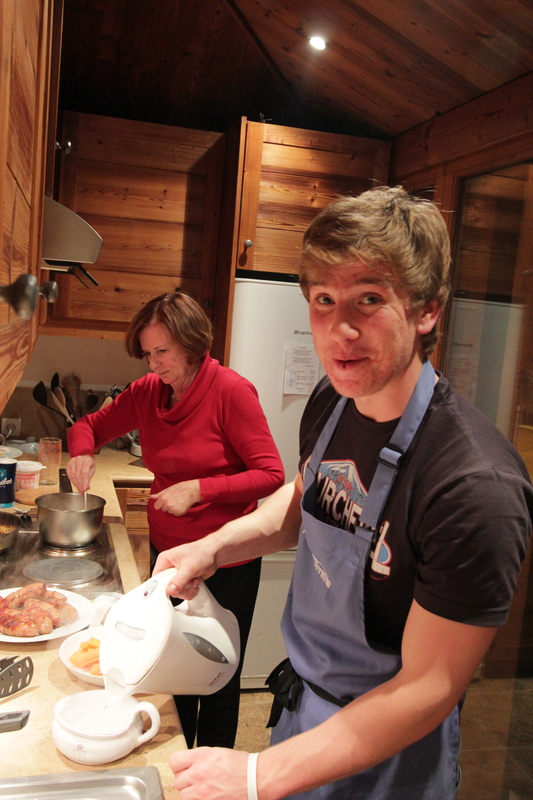 We’ve been in Courcheval, France over Christmas. It’s been lovely to be with Family after a three months of just the five of us save for a few days in Tokyo. Don’s parents, Greg and Judy, stayed with us for nine days. 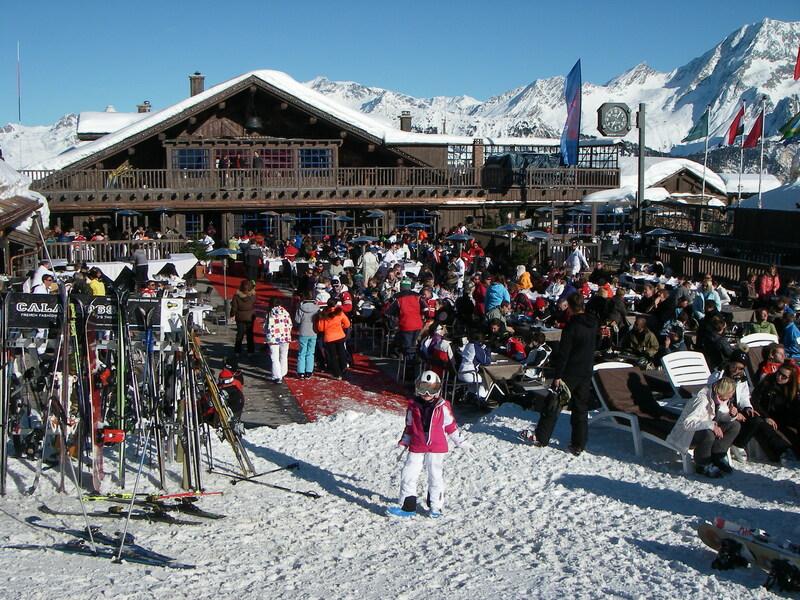 Courcheval, France brings new meaning to ‘over the top’ and absolutely everything reeks of total ‘chic-ness’. 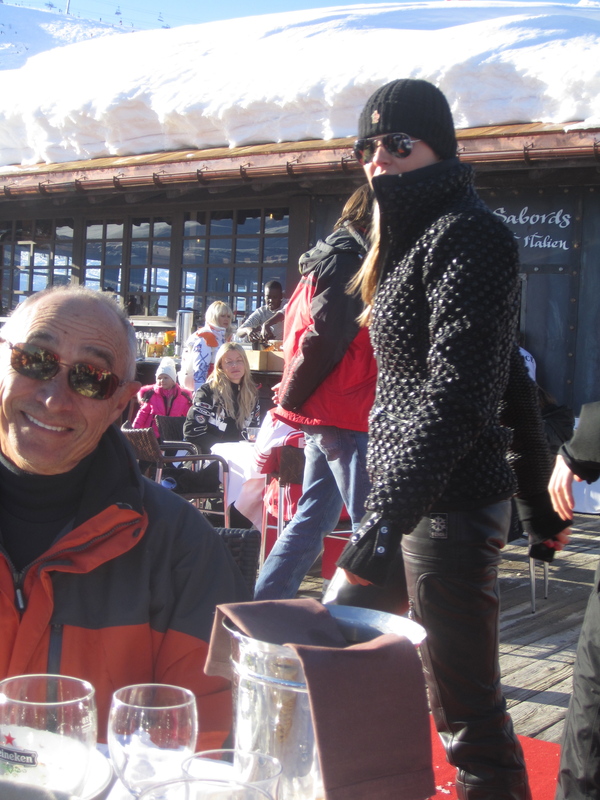 Fur hats and head to toe TIGHT black leather FENDI ski suits are de rigure here in Courcheval. Functional gortex, not on your life. Carriage rides, sweets shops, and carrousels make up the center of this quaint village, surrounded by the most high-end stores you may never have heard of. You may have guessed that it’s not the cheapest place, and you’re right…unless you are used to ordering $29 martini’s and paying 40Eur for spaghetti. 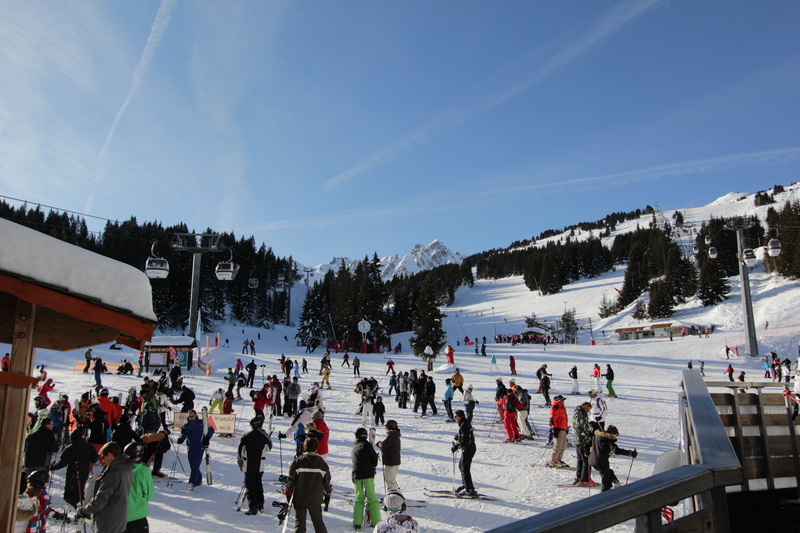 With all that aside, it’s a killer ski hill with excellent pistes for the kids, and for don and I. After being in all these new and strange places, being in Europe is like coming back home. Red wine, cheese, bread, and a language we can understand. Even if French is by no means our first language, at least we know what’s going on around us! It was a bit of a shock at first to be surrounded by all this snow. Do I like this? Why do I like snow again? Right, skiing! 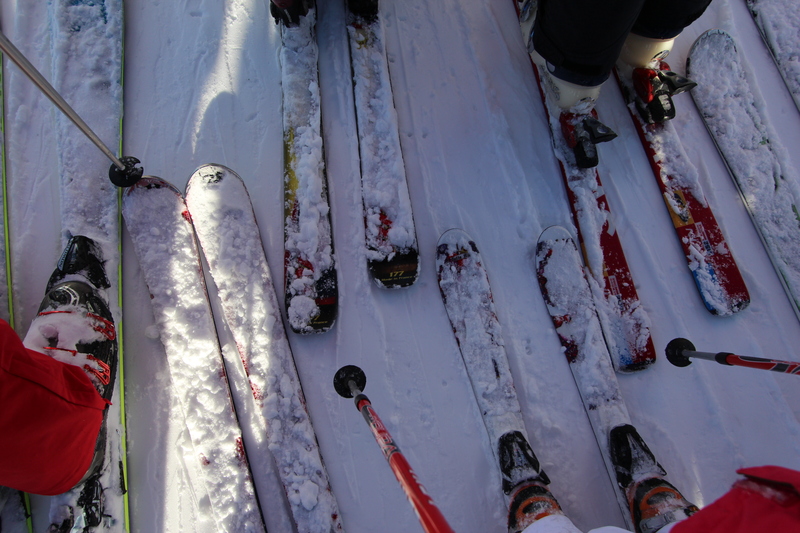 We love skiing!!! We’ve skied every day since being here. When we were sitting around our table in Pemberton, BC, four years ago planning this trip, skiing was top priority. 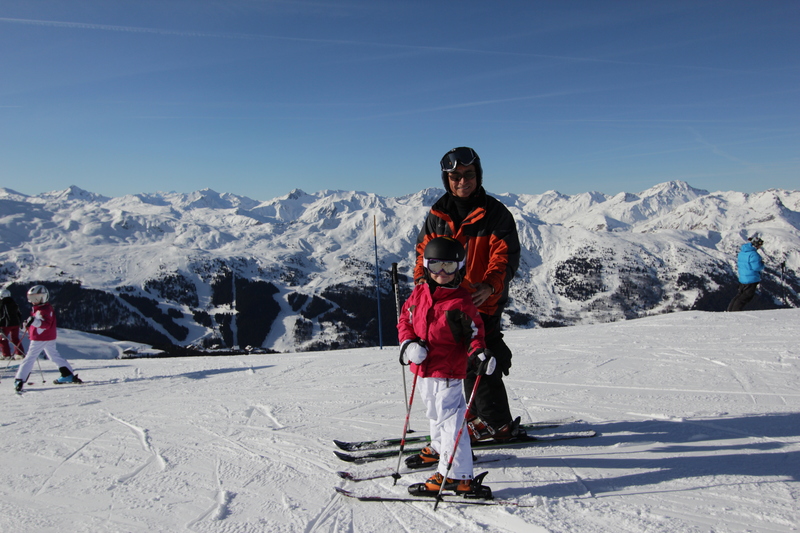 Could Ashton at four be ready to ski Europe by December 2011? Yes. he is!!! 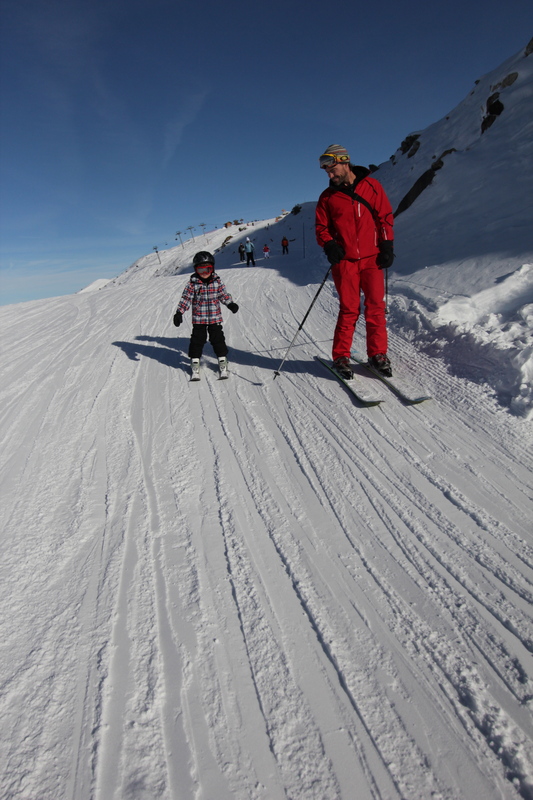 The kids are skiing beautifully and we can pretty much do most blues at a good clip. As an added bonus, for whatever reason, people don’t seem to really ski off piste (we’re talking two feet off the run), so we’ve had huge knee deep powder days with little work! Flying down runs, taking jumps, falling on the old-fashioned rope tow, conquering the Palma, looking at the amazing view, and lunching at Cape (cap) Horn. Cocktail time Kate? yup! Courcheval is a dream. We were standing at the top of a sketchy red run (groomed black) today discussing our route down steep icy slope, and Ashton turned to us and in his best impatient voice yelled, ” Stop panicking, and start skiing!” I guess he’s ok.
Elbows up kids! 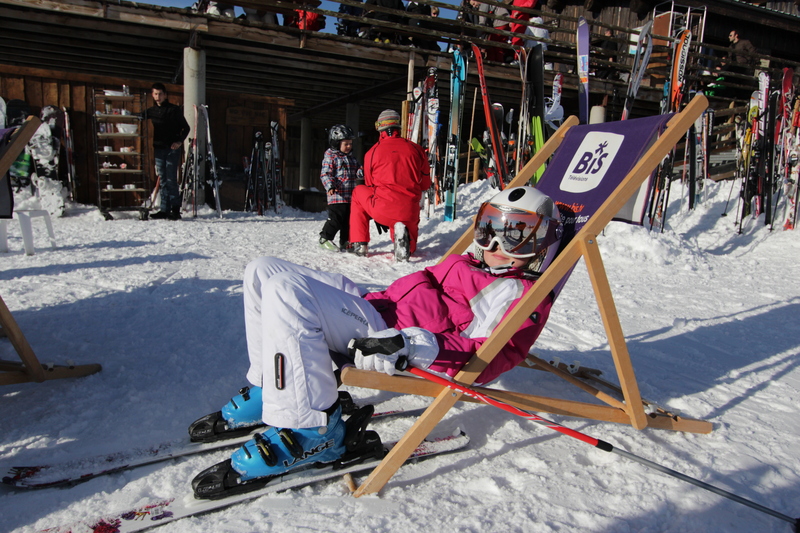 The kids have learned some important life skills in a french ski lift line-up. Eat or be eaten. Elbows up kids, elbows up! Greg and Judy have packed up and are off. It’s been fantastic to have some family and familiar faces around. Three generations of Anderson’s flying down the hill. Brilliant. 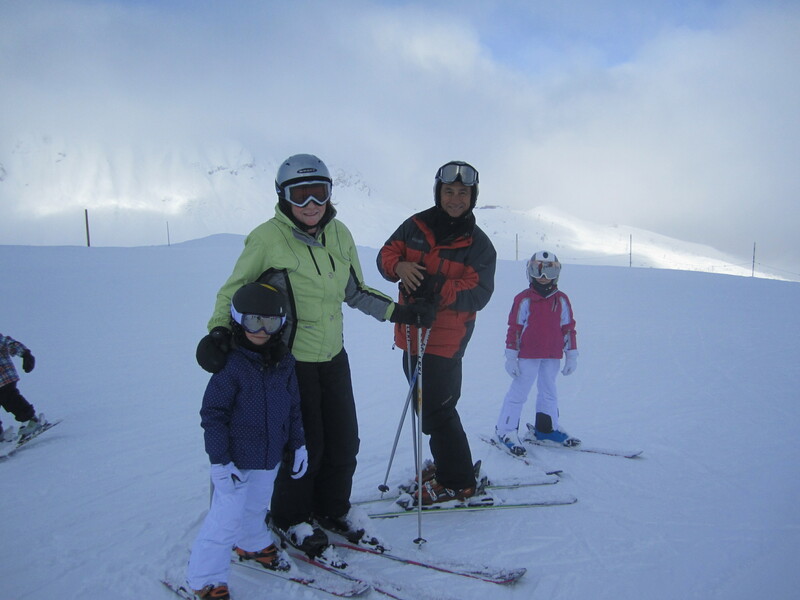 It’s been a golden moment of our family skiing. 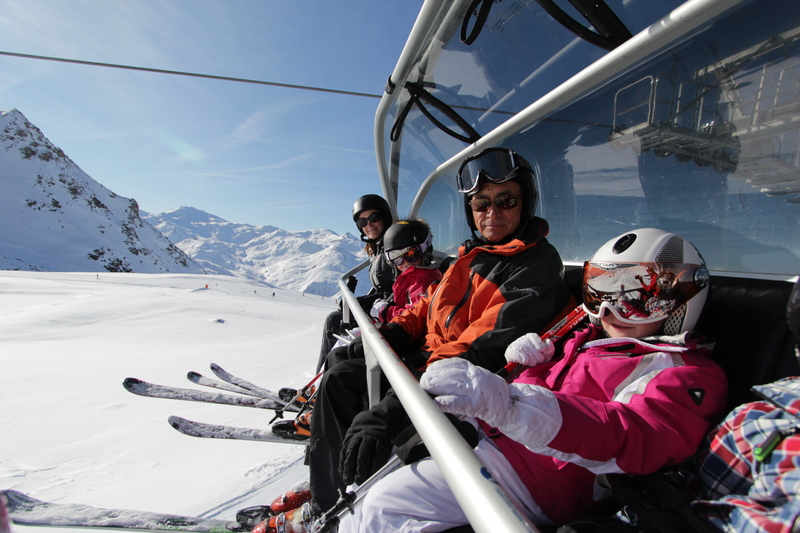 Courcheval is part of the absolutely immense Trois Vallees, the biggest ski area in the world with 198 lifts. Environmentally friendly ashtrays at Courcheval. 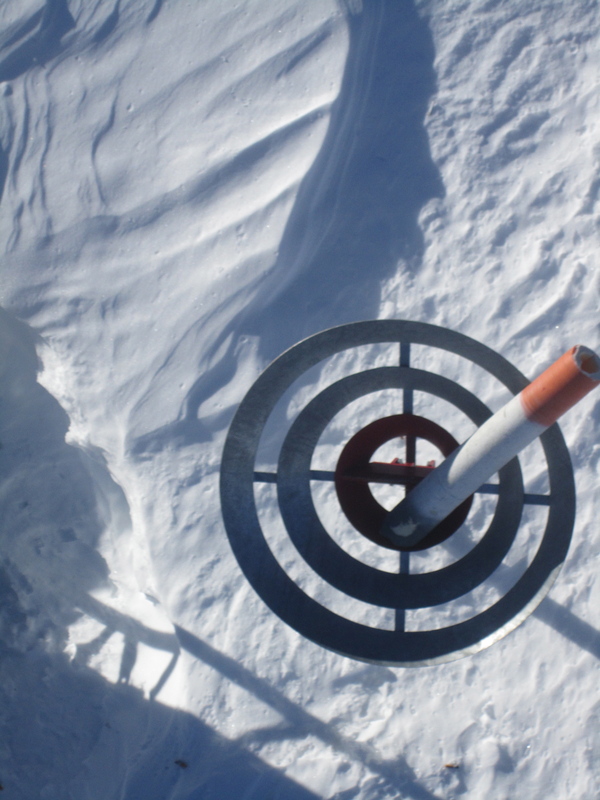 Aim from the chairlift at a giant 2ft ashtray. Really! Religion. We more or less didn’t really broach religion until we went travelling. We didn’t have to, and nor did we really want to. But in almost every place we’ve been, religion is a huge cultural force. Japan: Shintoism and Buddhism, Thailand: Buddhism, india: Hinduism, and Europe: Christianity. After trying to explain the Monkey man ripping his heart open (see India) with Shiva inside, baby Jesus is a cake walk!!! 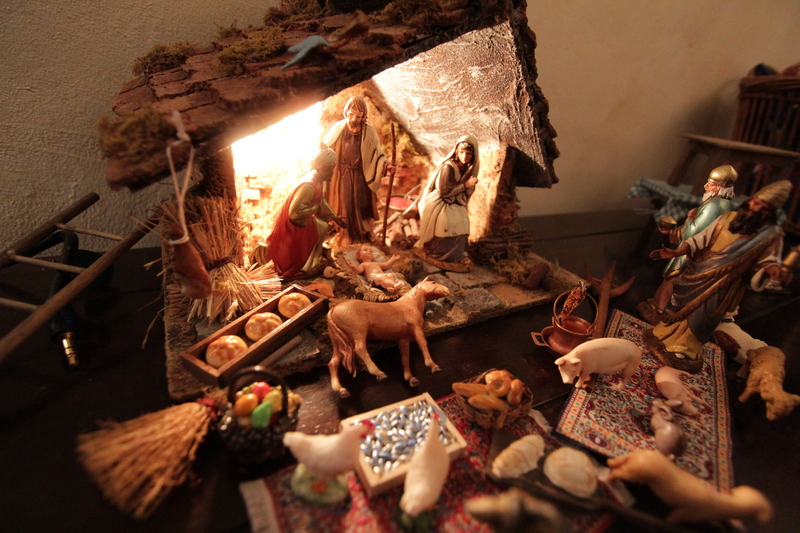 Don bought a nativity scene in Rome and ever after we have been celebrating “Baby Jesus'” birthday. 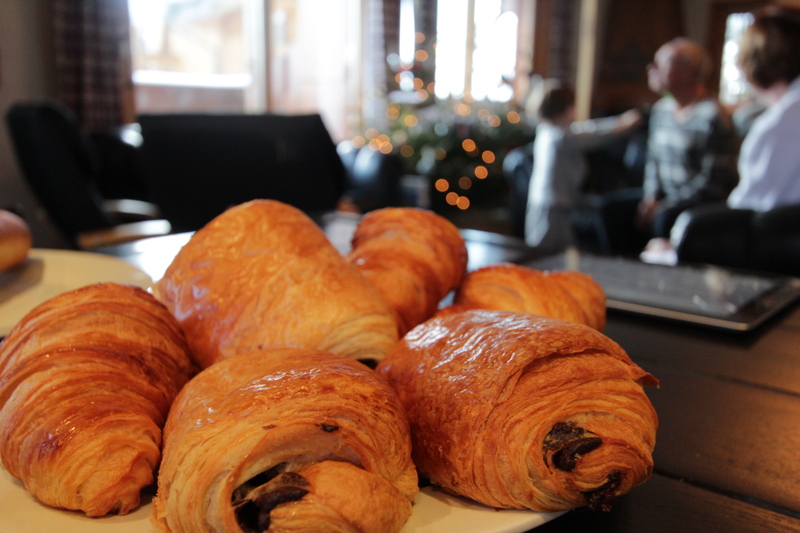 Fresh Pain-au-chocolate each morning. Amen. On the move again. We’ve significantly down-shifted to a one-bedroom apartment in Meribel, in the valley next to Courchevel for what will probably be our quietest new year’s in two decades. The next move will be a short one too, 20km as the crow flies (although a 2hr drive), east, to the Val D’Isere ski resort. Can we turn snow-plow into parallel in just one month?? Great winter pics! I bet it was fun skiing with Grandma and Grandpa! I bet you received plenty of hugs and kisses too!